After Sunday's Easter celebration, like most other Greek families all around the world we have a surfeit of roast meat and sweets left over; enough to feed my wife and I for the next couple of days (dare I say weeks!). In our family, my father has always insisted that every one of his Easter guests leave with something to take home, so he sees them off with aluminum foil wrapped packages and a wave at the door. But what do Greeks do with leftover roast meats? Well, in my family, we make tasty gyros (pronounced YEE-ros) sandwiches! The post-Easter period is an excellent opportunity to enjoy gyros sandwiches at home and there is really not much to it. All you need is some leftover roughly diced roast meat (pork or lamb or chicken), some Greek pita bread, some tzatziki (Greek garlic-yogurt sauce), some chopped onion and a dash of dried Greek oregano. Feel free to add or subtract ingredients like tomatoes, mustard and fried potatoes, depending on your tastes. 1. Spray pita bread (or fry pan) with a little extra virgin olive oil and fry pita on both sides until it is heated through and slightly toasted but still soft. 2. Place the well heated pita bread on a plate and spread a tablespoonful of tzatziki in a line across the middle of the pita. 3. Add the thoroughly warmed meat(s) directly overtop of the tzatziki, and top it all with the chopped onion and a sprinkling of dried Greek oregano. 4. Proceed to curl up the sides of the pita bread (making sure to leave a wider opening on one end), and complete the sandwich by pinning the curled edges of the pita bread together somewhere near the middle with a toothpick. 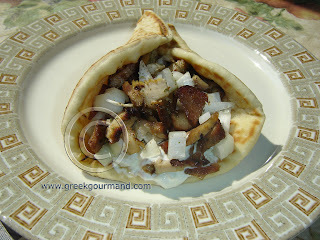 There you go, some homemade gyros you can be proud of... even if it is made with leftovers. 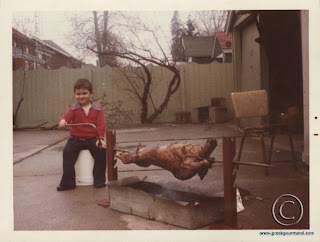 Happily turning the spitted Easter lamb in 1973! For over three millennia since the time of Homer’s Iliad (and likely long before), Greeks have been famous for roasting spitted meats. Indeed, if we take Homer’s word for it, Achilles and the rest of the Greek heroes who took part in the siege and sack of Troy ate little else. But then, what would one expect such legendary warriors to eat if not spitted roast meat? There is something inherently masculine in the whole affair of preparing and roasting an entire carcass over a bed of charcoal, and it has held a fascination for me since my earliest years. Our 2008 Easter lamb and kontosouvli roasting side by side. After the 40 day Lenten fast, the smell and taste of a little roast lamb is a truly fulfilling experience. As we were enjoying the wonderful food, drink, and weather yesterday at my parents' home, my father was in a fine mood and was re-telling tales of past Easter celebrations for my wife’s benefit. He went on to relate how on a couple occasions he had had to work a late night shift that carried through to the morning and had relied on the rest of us (mainly my mother and I), to have everything going when he arrived home from work on Easter morning. Until she heard my father utter these words, my wife (as she remarked to me later) had never truly appreciated just how deep-seated my fascination with Greek food really was. In answer, I dug up the earliest photo I could find of my love affair with Greek food and have used it to head up this posting (yes, that is me back in 1973). This year, my father dressed and prepared the lamb once more. Beside the lamb, he added a second spit of kontosouvli (‘short-spit’ in English translation), with a stuffed chicken appended for those among my family who do not care for lamb or pork (Yes, they do exist!). 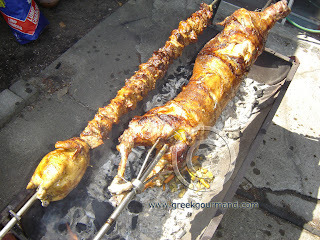 Now, the kontosouvli is essentially a giant pork souvlaki (which translates as ‘small-spit’ or ‘skewer’ in English). Though it is more customary to roast a kokoretsi (spitted lamb offal) alongside the Easter lamb, my father likes to mix it up and alternates yearly between kokoretsi and kontosouvli. Ensure that the meat is cut into largish chunks, about the size of an apple or so. Wash the meat well and then add it to a large basin or mixing bowl. Add salt, pepper, paprika, rosemary, garlic and wine to the meat and mix together well. Once the seasonings have been thoroughly mixed into the meat, add enough olive oil to ensure that the meat is entirely immersed, and then give everything another thorough mixing. Let stand in the refrigerator for 48 hours so the meat can be fully permeated with the flavourings of the marinade. Spit meat and roast over an open charcoal flame until well done. Cut the cooked meat right off the spit into a pan held under it and serve up immediately. The weather here in Toronto has been exceedingly pleasant of late. Spring has quickened the dormant life energies in the earth, and the sun’s growing light lengthens the days. Persephone has returned from the shadowy realm of Hades, her mother Demeter rejoices and paints Gaia with the most exotic adornments. Yesterday, I stepped out to inspect the small kitchen garden plot we have running the length of one side of our home. I was so excited by what I saw that I ran to fetch my camera. The first tender shoots of our mint patch had appeared! Mint is my favourite of all the herbs and not without good reason. 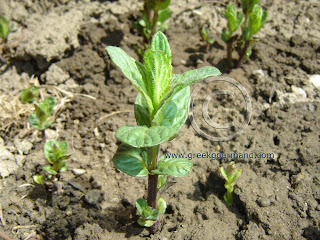 It is a universal ingredient in Greek food and can be added to practically any dish as ingredient or ornament. Mint is for me an inspiration and not merely a plant, and hopefully, I will pass a measure of my enthusiasm for this herb on to you, my reader. In Greek Mythology, there is a species of nymph who are known as Naiads and their existence is bound to flowing freshwaters; every spring, fountain and mountain brook has its Naiad. As the 19th Century Romantic poet P.B. Shelley illustrates in the poem Arethusa, a Naiad is the “shepherdess” of the inland streams and water sources of her locality. Minthe (Μίνθη) was a Naiad, and it is from her name that most European languages derive their names for the sweetest smelling of all the herbs. However, according to one ancient Roman scholar, the Greeks switched names for “minthe” just before the first Century of our era, preferring to call it ‘edyosmon’ (ηδυόσμον), ostensibly because of its sweet-smelling fragrance. "Dyosmo" remains as the name for this herb in Modern Greek. According to the myth, Minthe (who was as beautiful as only a nymph could be) attracted the amorous attention of Hades, god of the Underworld, during one of his scandalous forays above ground. But, before Hades could consummate his seduction of Minthe, his jealous wife Persephone caught up with the philanderer and turned his latest paramour into the familiar herb. Since he could not undo Persephone’s spell and restore Minthe, Hades bestowed the gift of a wonderful fragrance to the former Naiad as a consolation for her troubles. This tale is likely a clue as to why a wild species of mint 'calaminthe' (καλαμίνθη) was one of the ingredients that went into the kykeon - the sacred draught of the Eleusinian Mysteries, which were initiation ceremonies held annually as part of the cult worship of Demeter and her daughter, Persephone. When they were not swigging mint as part of some mystical potion, the ancient Greeks also used it to flavour their wine and foods. Furthermore, we are told that during the time of Themistocles (c. 524–459 BC), men at Athens were fond of wearing sprigs of mint behind their ear as some kind of fashion statement when they congregated for Assembly. Yet, there were also proscriptions against mint consumption, one of the most notable being Hippocrates’ warning that mint was not to be consumed by epileptics. Now, I think it is time I made some fresh mint tea with some of the leaves I harvested from the garden, sweetened with a teaspoon of Greek thyme honey. Yesterday, in preparation for the Greek Orthodox Easter (or Pascha) celebration, I made the traditional braided Greek Easter Bread known as tsoureki. I baked three loaves, one for my wife and I, one for our goddaughter, and one for our godson. As is typical, along with the bread, I dyed a dozen hardboiled eggs red. There is nary a Greek home anywhere on the planet that will not have these two elements present in the Holy Week to come. Easter is the most important religious celebration in Greece, and the customs and practices related to this period of the calendar are as diverse as the topography and regional differences within Greece. Yet, the dyed eggs and the plaited bread are universal. 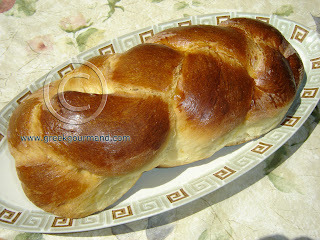 The reason we braid the tsoureki is to symbolize the Resurrection of Life that comes with springtime. The wedding of this symbolism to the Orthodox Christian Calendar and the figure of Jesus Christ is not a coincidence. The tradition of plaiting bread is old; it predates the arrival of the Gospel among the Greeks. The ancient, pre-Christian Greeks also baked braided breads (στρεπτικιος αρτος), and though some may have a problem with my referring to it in this context, when making tsoureki, I am always reminded of Ouroboros, the serpent which swallows its tail, one of the oldest symbols of the repeating cycles of Nature; the eternal renewal. From the dark and gloom of winter, we emerge into an increasingly illumined and awakening world that presages the coming of the summer sun, which gives us hope for the harvest to follow. There are some who make tsoureki as more of a cake than bread, but that is too sweet and gateau-like for my tastes… This recipe for the traditional Greek Easter Bread is exactly that: bread. Ah, but what bread! The subtle mingling of the customary aromatic ingredients of orange rind, mahlepi and mastic add their nuances to the trace sweetness of this bread and it goes down real easy, especially with some Greek coffee. Dissolve the yeast in 1 cup (250 ml.) of lukewarm water. In a large mixing bowl, slowly add 3/4 cup (175 ml.) of flour to the yeast while mixing well to form a thick, smooth batter. Cover the mixing bowl with a kitchen towel and put in a warm place to rise for 30 minutes. Cover dough with a towel and let stand ina warm place to rise for 1 ½ to 2 hours. It should at least double in bulk before being ready for use. Once it has risen, do not knead the dough, simply divide it into nine (9) balls of equal size and prepare a well-floured board or surface to roll each of them into 1 foot (30 cm.) long strands, approximately 1 inch (2.5 cm.) in diameter. Working with three dough strands at a time, place them side by side and pinching them tightly together at one end, proceed to braid the strands in an intertwining fashion, then pinch the loose ends together and fold both pinched ends slightly under the loaf. Spread a piece of parchment paper on (or grease) a large baking sheet and place each braided loaf on the sheet. When all three loaves have been thus prepared, cover them with a towel and place in a warm spot to rise for another 90 minutes. Each of the loaves should at least double in size. Beat and dilute one egg yolk with a slight bit of milk (about 1 tablespoon or 15 ml.) then brush the top of each of the loaves with the mixture; this is what gives the tsoureki its distinctive glossy brown colouring when baked. Place the loaves into an oven pre-heated at 350° F. (180° C.) and bake for 30-40 minutes until done. *Note: Optionally, you can sprinkle some chopped blanched almonds overtop of each loaf after brushing them with the egg-yolk mixture before putting them in the oven. I didn’t do this as my godson has a nut allergy. Well, there you have it, a tsoureki to break bread with on Easter morning. For all those who are celebrating Greek Easter, I want to take this opportunity to wish you a Joyous Resurrection! Having reserved for myself the prerogative of reflecting upon Greek Food as a Subject on this blog, I wish to briefly examine the matter of Presentation. This discussion is exploratory and not meant to offend nor excite, so please take it for what it is: a prolegomenon about matters which I deem interesting and that pertain to Greek Food & Gastronomy. So, it is with some amusement that I shake my head whenever I read or hear about the “new Greek cuisine”; as if we were already so overly familiar with the “old Greek cuisine” that we needed to re-interpret and re-present an entire culture of food as something which it is not. I wonder if this sort of thinking is not some kind of a spin-off symptom from the perverted realm of Political Correctness, as odd as that may sound… The fact is, I don’t rightly know where it originates, and I have a difficult time understanding the motivation behind such an attitude, unless it is simply rooted in some deep-seated sense of inadequacy or need for attention. During a recent discussion of this very topic, somebody actually asked me if I thought a traditional Greek dish like Moussaka was something one could present to the Queen of England! As amusing as I thought the question to be at the time, I had to provide an answer, so I responded in the affirmative and went on to display the photo of the slice of moussaka which I used to head up this posting. As can be plainly seen in the picture above, there is nothing, not even a sprinkle of shredded parsley on that plate, except for the solitary piece of moussaka. Is it not aesthetically pleasing enough as it is? Do I really need to do it differently? What would have been gained if I were to have dressed the dish up beyond all recognition? Perhaps there is someone out there in the wide world who could answer these questions and settle my curiosity; though I do not think that they will ever be able to completely convince me that Greek food needs to be something other than it is: rustic, unpretentious, and wholesomely flavourful. P.S. 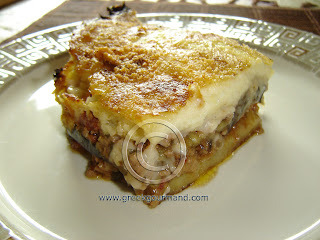 For those of you who are wondering what the heck Moussaka is... I will get to that eventually... siga, siga ("slowly, slowly") as the Greeks say. As for the potatoes, I use (and recommend you use) the Yukon Gold variety as their yellow flesh bakes in and absorbs the lemon juice and olive oil wonderfully well, and yet they retain a nice cruchiness around the edges. When I'm in Greece, I only use Arcadian potatoes. The oregano has to be Greek, and only the highest quality Greek extra virgin olive oil will do. Now, follow my directions to the letter and you will enjoy a pan of perfect lemon potatoes! 2.5 lbs. (1 kg.) potatoes washed and peeled. 2. Cut the potatoes into thin wedges, slightly bigger than fries but not too big as you want them to cook through and crisp slightly on the outside. 3. Spray or sprinkle some olive oil to coat the bottom and sides of a deep-walled medium sized baking pan (I prefer using a stone bakeware pan and would recommend it if you have one handy). 4. Spread the potato slices out evenly across the bottom of the pan and liberally sprinkle salt and fresh ground pepper overtop. 5. Add enough water to the pan to almost but not quite cover the bottom layer of potatoes, then add the lemon juice and lemon rind and using your hands give the potatoes a good mixing in the pan to ensuring an even soaking and to help spread the salt, pepper and lemon zest. 6. Pour the rest of the olive oil overtop of the potatoes making sure to try and cover all of them, then sprinkle the oregano over everything and place the pan into the oven for approx. 50 minutes. When the potatoes are visibly crisping at the edges it is time to either remove the pan or turn the oven off. NOTE: make sure to give the potatoes a good mixing at the halfway mark, say after 25 minutes or so, to guarantee a thorough and even baking. Makes 2-4 servings, depending on whether they will be served as a side or on their own. These perfect lemon potatoes are sure to be a hit! 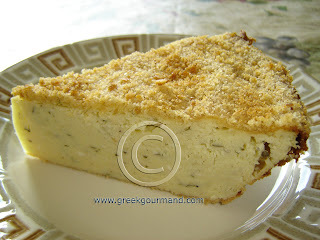 There's nothing like some Big Fat Greek Potato Pie! One of the most distinguished and yet least well-known figures of Modern Greek and European History is the Corfiote (i.e. from the island of Corfu), Ioannis Kapodistrias. He was born in the year of American Independence, 1776, when Corfu and the rest of the Ionian Islands were still under Venetian dominance. As one of his ancestors had received title from Charles Emmanuel II, Duke of Savoy, Kapodistrias was a hereditary Count whose family name was entered in the Libro d'Oro of Corfu in 1679. At age 21, he left home to study philosophy, law, and medicine at the University of Padua in Italy; from there he went on to establish himself as one of the foremost figures in European diplomatic history of the early 19th century. Count Kapodistrias was the arch nemesis of the legendary Austrian “Fox” Prince Metternich, and he was directly responsible for the diplomatic recognition of a neutral and independent Switzerland (even as we know it today). He was also appointed joint Foreign Minister of Russia by Czar Alexander I. While Count Kapodistrias was busy making a great name for himself by assiduously engaging in European diplomacy and politics, in 1821 his countrymen had raised the banner of freedom and were successful in liberating a large chunk of their homeland from the Ottoman yoke. In 1827, as the still fledgling Modern Greek state was being formed through a bootstrap National Assembly, a leader was sought who could act as an independent “Governor” to bridge the various established factions and form a cohesive bureaucracy that could function as an effective government. As he was the most illustrious Greek of his day in Europe, the (almost) unanimous choice as the very first Governor of an independent Modern Greece was, you guessed it, Ioannis Kapodistrias. Among his many accomplishments before and after he accepted the invitation to govern Greece, there is one priceless (literally!) anecdote that led me to write about this singular figure of Modern Greek history. Count Kapodistrias occupies a distinguished position in the history of Greek Gastronomy, for he was directly responsible for the introduction of the tuber which became known as “patata” to Greece. It may surprise some to learn that those famous Greek lemon potatoes are relatively recent developments in Greek cookery, but so it is. From its indigenous origin in South America, and one century after it had been introduced to the rest of Europe, the humble potato finally reached Greece and what a reception it got! At first, people were wary of the agents who appeared in the marketplaces and offered sacks of potatoes to anyone who would take them at no charge whatsoever. Nobody wanted anything to do with them or their newfangled ‘food’. As there remained much widespread impoverishment among his compatriots due to the length and violence of the (then) still recent struggle for independence, Governor Kapodistrias believed that the introduction of a crop that could produce three harvests per annum would go a long way towards easing the recurring food shortages, especially in the urban centres of his fledgling state. Since the uptake of the potato among the Greek populace did not exactly take off to his satisfaction, the ‘Governor Count’ concocted a stratagem to trick his countrymen (and women) into accepting the potato as food. He had the entire shipment of potatoes offloaded onto the dock at Nafplion (capital of Greece from 1829 to 1834), and ordered armed guards be set up to keep a not very vigilant eye on the potato stockpile. The guards were explicitly instructed to turn blind eyes at convenient moments. Once the guards were in place, the curiosity of the populace was piqued and they were keen to discover why these potatoes were deemed valuable enough to guard with armed soldiery. Some of the braver souls took advantage of the subtle carelessness of the guards and ‘stole’ some of the potatoes in order to try them out. In no time, all the potatoes were stolen away and the rest is Greek culinary history! 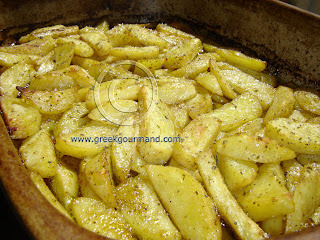 Today, whether baked, roasted or fried, the potato has become a staple food in any Greek home. The most prized potato variety in Greece is cultivated in the province of Arcadia in the central Peloponnesus; though spud cultivation is common enough throughout Greece, Arcadian potatoes fetch a premium in the marketplaces of the country. Harvesting of potatoes in Arcadia begins as early as March and carries through to the autumn. If you ever get the chance to sample pan baked Arcadian new potatoes still fragrantly fresh from the fields in late July, you will swear the Olympian gods themselves, and not Count Kapodistrias, had gifted the potato to Greece! So, I would like to dedicate this recipe for Greek Patatopita or 'Potato Pie', in honour of the first Governor of Modern Greece: Count Ioannis Kapodistrias. 1. Wash and peel potatoes, then cut them into small chunks and boil in plenty of salted water until soft (approx. 30-40 minutes). 2. Drain potatoes when they are fully cooked and place in a large mixing bowl then mash them well and leave to cool slightly for a few minutes. 3. Add the two cheeses, mint, nutmeg, salt, pepper and well-beaten eggs to the mixing bowl and incorporate well with the mashed potato until the entire mix is smooth and creamy. 4. Using one (1) tablespoon of the oil, grease a pie baking pan well and then spread a little less than half of the breadcrumbs evenly across the bottom of the pan. 5. Pour the potato pie mix into the greased pan and spread it evenly. 6. Evenly distribute the rest of the breadcrumbs across the top of the evenly distributed pie mix and spray the remaining olive oil overtop. 7. Place the well-filled pie pan in an oven pre-heated to 350° F. (180° C.) for 40-45 minutes or until the top of the pie is golden-brown. Note: The pie will rise while in the oven and will settle when removed to cool, so don’t be surprised by either state. 8. Remove pie from the oven when it is ready and let stand to cool for 1 hour before slicing and serving. Patatopita makes an excellent side for a baked/stewed vegetable or red meat dish, or it can be eaten on its own with a handful of Kalamata Olives as an accompaniment. Rice has been known and consumed in Greece since ancient times. The first mention I could find in the historiography is a reference to one of Sophocles’ lost (to us) plays. The Poet is quoted as mentioning a type of bread made with rice called «ορύνδου» (O-REEND-thoo). The noun «ορύζης» (O-REE-zis) in ancient Greek is the root of our modern English word “rice” (Oryza sativa… not to be confused with other types of sativa... ;-). Then, as now, rice was mostly imported to Greece from climes that were better suited to the intensive wet-paddy agricultural environment required for its cultivation. For the ancients, rice was considered a rare luxury and it fetched a handsome price in the markets when it was available. It was not until Alexander the Great’s conquest of the East that rice became a relatively more common element in Greek gastronomy. Thus, although both the ancient Greeks and later the Romans were familiar with rice neither nation actively cultivated the marsh grass with the starchy grain seed. It was the Arabs who came into contact with the Byzantine Empire in the 7th Century A.D., who made a steady supply of rice available to Europe through Anatolia in the Eastern Mediterranean, and Southern Spain in the Western end of the “Middle Earth Sea”. Although an effort has been made in recent years to flood certain parts of the delta plain along the river Axios near Thessaloniki for rice cultivation, the overall domestic Greek rice yield is around 200,000 tonnes per annum. Yet, Modern Greek cuisine is full of tasty and easy to prepare traditional rice dishes that will leave your lips smacking for more! 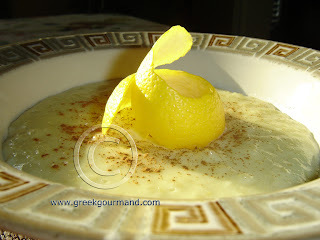 I have already shared my Domatorizo and Gemista: Stuffed Peppers and Zucchini recipes, and now I thought I might introduce you to my favourite scrumptious rice dessert recipe: Rizogalo (Ree-ZO-galo) which literally translates as “Rice Milk” but is actually a pudding… Greek rice pudding. In a pot over a moderately high heat, bring milk to a slight boil. Add the rice to the milk and stir well until the boil returns, then reduce the heat to medium-low and gently simmer uncovered for 30 minutes. Make sure to stir the mixture regularly so the milk does not congeal or stick to the sides and/or bottom of the pot. Add the sugar, vanilla extract and citrus rind and continue to simmer and occasionally stir the rice and milk mixture for another 10 minutes. Beat the egg yolks with a quarter cup (60 ml.) of cold milk and whisk in the corn flour* (optional) and mix well. After the ten minutes in Step 3, pour the egg yolk mixture into the pot and whisk well to incorporate, and then simmer for another 5-10 minutes until thick. Remove from heat and using a ladle, spoon out the mixture into bowls and let stand for one hour to cool. Sprinkle with cinnamon and garnish with a curl of shaved citrus rind. This rice pudding is particularly good when refrigerated for a couple hours and served on sunny, warm days. The citrus rind adds a whole new dimension of flavour to the dish and leaves a wonderful lingering hint of lemon, orange or lime on the tongue, depending on your preference. May Apollo and the Nine Muses of Olympus bless and keep you all! Nancy is a veritable legend when it comes to Greek food on the Internet. Her recipes, postings and discussions of Greek food on the About.com web site are a testament to her love of Greek cuisine and her desire to share that passion with the world at large. Now, I have not met nor spoken with Nancy, but she is a member of my Greek Food group on Facebook and probably does not know that I am aware of her activities relating to Greek cookery. So, this endorsement has nothing to do with any personal connection and everything to do with respect for her dedication to my own greatest passion: spreading the Gospel of Greek Gastronomy… Hats off to you, Nancy! I am sure that there are many others blogging about Greek food with whom I have yet to come into contact or discover, so let me state that in addition to Nancy, I would also like to salute and acknowledge the Unknown Greek Food Blogger wherever, and whomever, you may be! Grandma would be proud of my variation on her Greek 'risotto' recipe. I will never forget the first time I tried a Risotto dish at an Italian restaurant. My vegetarian date was all aflutter about this particular Italian recipe called ‘Risotto al pomodoro’ so it was the must-have dish on the menu for me that night, and it was not cheap! Now, when the ‘Risotto al pomodoro’ arrived at our table, I could not suppress a quick laugh. Immediately, I recognized the dish as similar to my grandmother’s recipe for ‘Domatorizo’ (pronounced “Doe-ma-TOW-reezo”). But, my grandmother had never been to Italy, and in fact, I would have been surprised if she would have been able to point Italy out on a map… About all that my grandmother knew about Italy and Italians was that they had attacked Greece along with the Germans in the Second World War, when she was a young woman. So, I ate the ‘Risotto al pomodoro’ that night and it was tasty enough, but with the memory of my grandmother’s recipe playing about in the back of my mind and along the edges of my tongue, I could not say it was a fair comparison. Now, I love Italian food so don’t get me wrong, I just think that my grandmother’s ‘Domatorizo’ soundly whipped the competition, and I would put it up against any similar Italian Risotto recipe any day of the week and twice on Sundays! In point of fact, my grandmother’s contribution to this dish was the ‘tomato with rice’ element to which she occasionally added pine nuts and/or raisins, whereas I added the feta cheese, oregano, and green onion, which makes this recipe one of my signature dishes. 1. In a medium sized saucepan, saute the onion in the olive oil until soft and then add the rice and continue to stir into the onion at a high heat for 2 minutes. 2. Add the fresh tomato juice/strained fresh tomato pulp and the wine to the rice and let simmer for a few minutes, stir the rice often to keep it from sticking to pan bottom. 3. In a separate, smaller saucepan, mix the 2 cups of water with the tomato paste and bring to a boil. 4. Add the boiling water with tomato paste from the smaller saucepan into the simmering rice in the medium saucepan along with salt and pepper to taste (and the optional pine nuts/raisins), stir well and cover to simmer over a medium-low heat for 15 minutes. Make sure to occasionally stir the rice (about every 2-3 minutes or so) to ensure that it does not stick to the bottom of the pan. 5. When the rice is cooked remove the saucepan from the heat and cover the pan with a cotton cloth before covering it with the lid. Let stand for 10-15 minutes. 6. 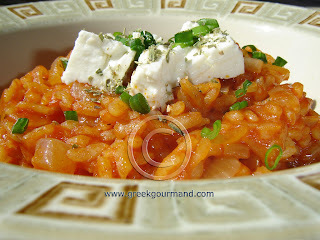 Spoon rice into serving bowls and add some of the cubed/crumbled feta overtop. Sprinkle the feta with a pinch of dried Greek oregano and garnish the dish with some finely slivered or chopped fresh green onion. In the past, when Greeks and Turks were not trading blows, insults, threats, or populations, they somehow found the time to swap recipes, as all longtime neighbours do… Now, there are those who claim that certain Greek foods are Turkish, and there is the counterclaim that many Turkish foods are actually Greek. But who really cares? The Greeks make a certain dish one way and the Turks in another. I have tried both the Greek and the Turkish versions of this recipe, and both versions were equally enjoyable. The name of the dish “Imam Bayildi” is Turkish for “The Fainting Cleric” and as the legend has it, a certain "imam" (the Muslim term for a religious leader) had just completed a long fast and when this dish was set before him, he was so overcome with the mouth-watering aroma that he fainted. So, whatever the dish may have been called before, it was thereafter renamed in his honour. 1. Wash eggplants well and remove stems and ends. 2. Using a sharp knife, make 4 deep lengthwise slits in each eggplant, make sure each slit runs almost up to but not through each end as we don’t want the eggplant separating into quadrants. 3. Sprinkle salt inside each incision in each eggplant then place the eggplants in a saltwater bath for one hour to drain away their bitterness; then remove and wash eggplants and leave to drain for 5 minutes. 4. Heat olive oil in a large frying pan and add the eggplants. Be sure to turn the eggplants a quarter turn or so every couple minutes to ensure even cooking and fry them until the skin becomes soft and they begin to wilt. 5. Remove the eggplants from the oil and set side by side in a baking dish, always with one incision facing straight upwards. 6. In the same oil the eggplants were fried in, add the chopped onion and sauté until golden then add the tomato pulp and bring to a boil then simmer for 10 minutes. Stir in the garlic, parsley, salt, pepper, nutmeg and simmer for another 5 minutes then remove pan from heat and allow mixture to cool slightly. 7. Preheat oven to 350° F. (180° C.). 8. Using a teaspoon carefully spread open and fill the topside incision on each eggplant with generous portions of the onion mixture, but be careful not to split the eggplants through as they will be very soft. Once the eggplants have been filled, if there is any leftover onion mixture simply place it in the pan among or between the eggplants and pour any remaining oil from the frying pan over everything. 9. Sprinkle some breadcrumbs overtop of each stuffed eggplant and then place pan in oven and bake for one hour. Note: As with all oil-rich foods (‘lathera’ in Greek), this dish is best served cool to allow the flavours to coalesce so let cool to room temperature before serving. If you leave it out overnight, it will be even more flavourful on the morrow.